Thursday, December 11 2014, Jazz Gallery Center for the Arts sees the return of the Coffee Klatch, the signature gathering tool by Los Angeles-based artist Linda Pollack as part of the “Habeas Lounge Riverwest” project implemented for the Riverwest Artists Association this past summer. ”Habeas Lounge” was dedicated to “the fine art of the public hang out” and the daily Coffee Klatches, along with Sunday Potlucks, urban hikes and other gatherings were developed in the service of connecting neighbors of Riverwest, and connecting different constituent groups of the Riverwest Artists Association (RAA) to each other. 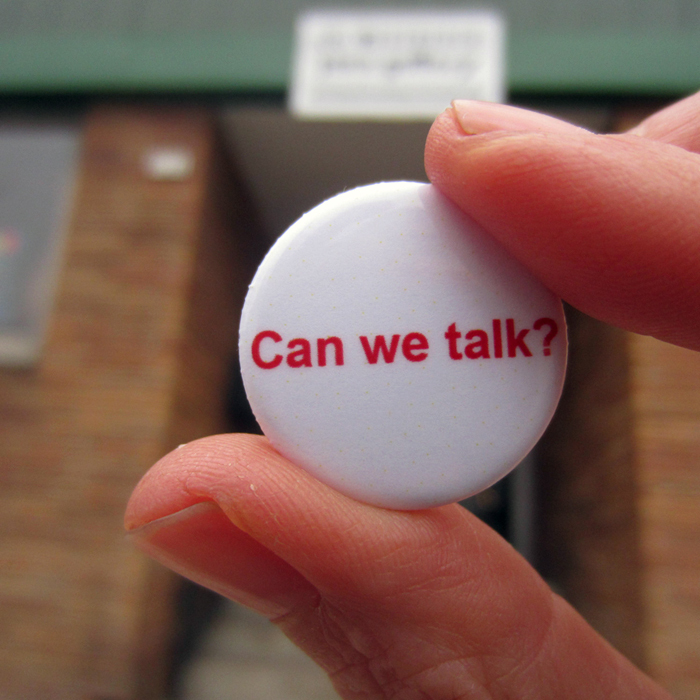 Thursday’s Coffee Klatch will also serve as the official launch of the exclusive “Can We Talk?” button. “Can We Talk?” was inspired by Linda’s time at Jazz Gallery and became the theme to Linda’s summer in Milwaukee.